Some of the tips you’re about to read is similar to the concept of clutter, which belongs to modern psychology and not classical feng shui. Nonetheless, I have listed them not just because feng shui experts included them as feng shui tips, but mostly because they actually worked for most people that I talked to. Keep in mind that these feng shui tips can only get you so far. What’s important is that you make the effort to find love or improve your relationship. Don’t ever expect feng shui to do all the work for you. So here are the feng shui love tips from around the web, along with a few of my thoughts and comments. The above image shows a bed with a good solid headboard. The above image is an example where both sides of the bed are easily accessible. Artworks have a profound impact on our emotions. Do not hang paintings that depict violence, sorrow, or religion (such as angels) in your bedroom because it can invoke strong emotions that’ll distract you from your sleep and bedroom romance. Instead, try to use artwork that symbolizes love, such as two lovers kissing each other, because they can influence your behavior through social proof. In other words, you’ll feel more comfortable connecting intimately when you see another couple doing the same. 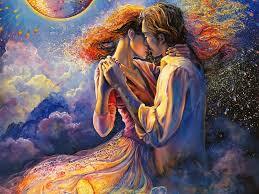 This is an oil painting that depicts love and is suitable for the bedroom. Television is a distraction to bedroom romance and sleep. If the TV is on, your attention is given to the TV instead of your loved one that’s right beside you. It prevents you from making intimate connections or have meaningful conversations with your partner. Further, TV is an electronic device that belongs to the fire element and brings Yang energy, which is not the energy you want in your bedroom. Some feng shui experts suggest that you remove work-related furniture in your bedroom because it reminds you or your partner of work. Some experts go even further for the same reason, telling you not to bring laptops or even your smartphone to bed because of our constant need to check emails. When your mind is fixated on work, you are less likely to give your partner any kind of attention. Further, constantly being reminded about work is likely to create stress that’ll adversely affect bedroom romance. In today’s world, work is not the only factor that’s affecting people’s intimacy in bed. Like many other tips listed here, this tip is more of a modern feng shui approach. Furniture on both sides of the bed should be the same because it promotes feelings of equality and the notion of partnership. No one is having extra space on the nightstand, and there really is no better side of the bed. This seems to me that it’s really one less thing for a couple to fight about. You should declutter not just your bedroom, but your whole house as well. Although decluttering is not part of classical feng shui, many feng shui experts still include this as part of a tip that’ll improve relationships and romance. Clutter is a stress factor that can affect us mentally, and when the stress boils over, patience and tolerance for your partner can decrease significantly which can lead to constant fights. Plus, having less clutter around the house prevents couples from confronting each other with statements such as “clean up your stuff!” It is one less thing for couples to fight over. Though this has more to do with modern psychology than classical feng shui, I think this is a good tip to follow. 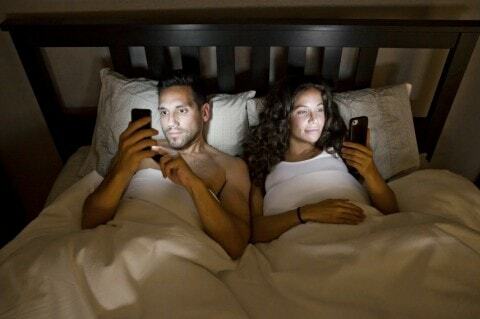 Having photographs with people’s faces, not just your friends and family, can adversely impact bedroom romance. This is because most of us are uncomfortable displaying affection in the public, and having photos in your room will sometimes feel like as if people are looking at you. Many experts have mentioned that mirror facing the bed tends to bring the energy of the third party into your intimate relationship. I’m not sure how this is, but I can imagine that this feng shui saying originated from accumulation of experiences. 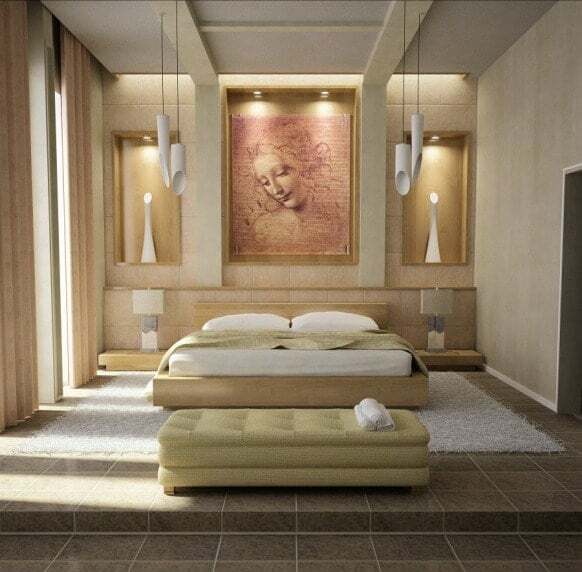 In any event, mirror facing the bed is just bad feng shui that can affect your sleep in various ways. 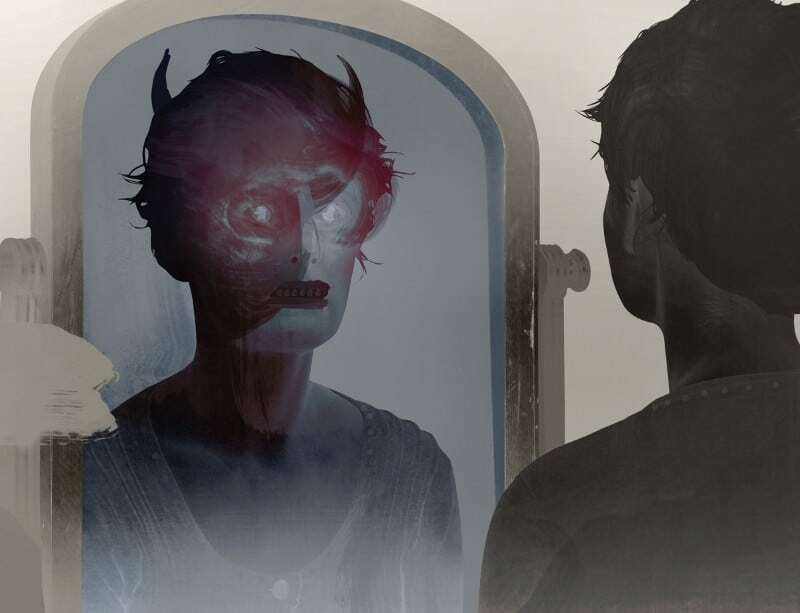 Stare at yourself and you may actually see a distorted version of your own face when you’re about three feet away from the mirror in the dark room, according to the strange face-in-the-mirror illusion experiment. By additional rooms, I mean an actual living space with sofa or even a bed (and not a walking closet) that’s divided by a sliding door or some kind of divider. Though this is rarely seen, some experts have claimed that an additional room invites infidelity into your relationship. This tip does not have much to do with classical feng shui but can help some individuals. Some people are just uncomfortable displaying affection publicly. But sometimes it’s not just the sight, it’s the sound as well. If your partner is more introverted, you can improve bedroom romance by closing the window or installing heavier doors to increase privacy that’ll shield not just sight but sound as well. Yin energy helps people relax. That’s why the bedroom should use dimmer lights, soft music, or colors that induces relaxation. As mentioned earlier, stress decreases bedroom romance. A bedroom with more Yin energies can help you and your partner relax, which will naturally open the doors for the both of you to connect intimately. Some suggest that the bathroom should be transformed with healing energy that gives off a sense of beauty and spa-like pampering energy. Others suggest to include beautiful heart-shaped decors, flowers, and artworks. I think these tips can definitely help with your relationship because it communicates love and care. However, I think this tip is not really related to classical feng shui. 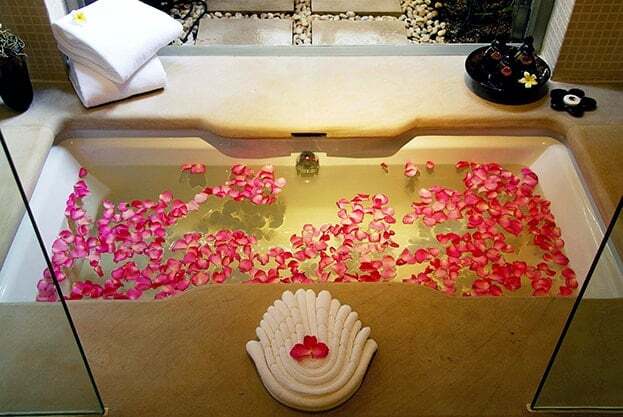 Adding some flowers can always create a more sensual energy in your bathroom. The Southwest corner of your home is considered the love area, and bathrooms in the Southwest area is said to negatively affect your love relationships because bathrooms are notorious for its bad feng shui. To minimize its effects, experts have suggested to use Fire and Earth elements to strengthen that area because Southwest belongs to the Earth feng shui element. Also, don’t forget that good habits, such as closing the toilet lid and keeping the bathroom clean can help minimize a bathroom’s bad feng shui. Many have suggested that flowers can be used to promote love. Singles who wish to marry should display a vase of peonies in the living room. Just don’t put it in the bedroom because plants are generally not suitable for the bedroom. If placed correctly, flowers have the ability to bring “peach blossom luck” (more below), which is suitable for singles but NOT for married couples because it’ll invite other parties into your relationship. These artworks can range from paintings to other types of home décor. As mentioned earlier, they are most suitable for the bedroom and sometimes the bathroom. 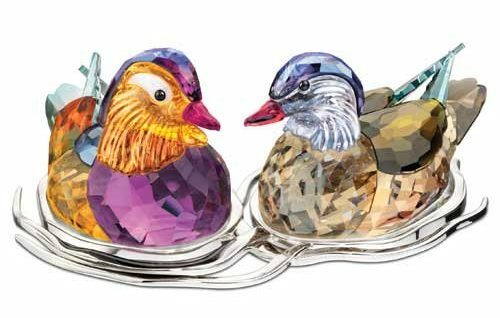 Artworks with a pair of Mandarin Ducks are the most popular, well known, and widely used traditional feng shui cure for love. I personally suggest that you pick the artwork that you have the most feel for. Some say that feng shui suggests that you remove objects from your previous relationships because it’ll help you move on. Though I don’t disagree with the tip, I don’t think this is related to classical feng shui. Other more credible tips ask you get rid of the bed and mattress from a previous relationship because you’ll be sleeping with the negative energy from your former lover. If your bed is at the end of a long hallway or corridor, or is lined up with the front door, your romance could be negatively affected. If that’s your case, an expert suggested that you hang mirrors diagonally opposite of each other in the hallway, or suspend a small crystal sphere from a silver thread directly inside the door as cure. Candles have the ability to add sensuality to an environment, and red, pink, and multi-colored candles are said to be feng shui love cures. Candles have the ability to strengthen the fire element and conflicts with the water element, so be sure to use candles wisely according to the feng shui element of that area. If you’re married or in a relationship, you can place happy photos of you and your partner around the house. That includes the kitchen, hallways, or any high-traffic area. Though I don’t think this is feng shui related, I do agree that reminding yourselves of happy times together creates inner positive energy that’ll boost the intimacy between you and your partner. Happy photos bring back pleasant memories and creates inner positive energy. The idea behind this is that furniture should be arranged to support communication. So if you can put the front legs of all the living room sofa on a rug, people will tend to sit there to talk, thereby increasing the chances of an intimate connection. Relationships can be loving, toxic, or both. If you are (or were) in a bad relationship that is hard to end, one way is to use a small rooster figurine to help break off that relationship. To do so, place the rooster on a shelf that’s higher than the average human height with its beak pointed towards the front door. 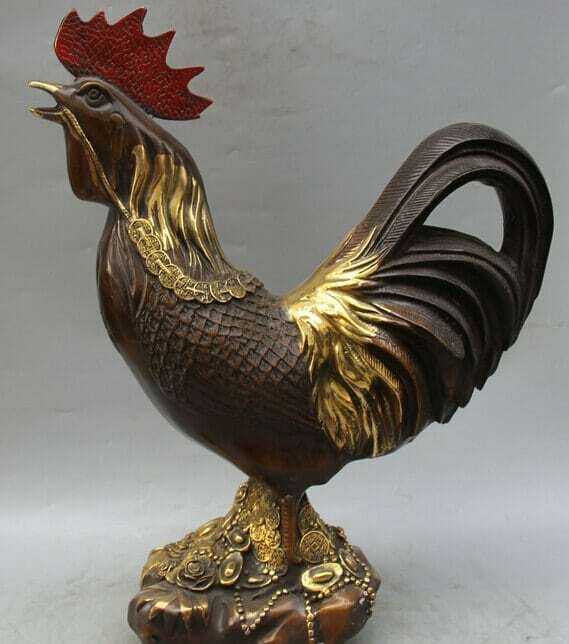 A typical Feng Shui rooster figurine. The Peach Blossom Luck is only suitable for those looking for love (not for those who are in a relationship), and its area in your home differ by the person’s animal sign. To activate your Peach Blossom Luck, the easiest way is to place fresh flowers in that area of your home. Below is a chart to help you find the direction of your Peach Blossom Luck. Use your animal sign and this chart to find your Peach Blossom area. The Southwest area of your home is your love area. 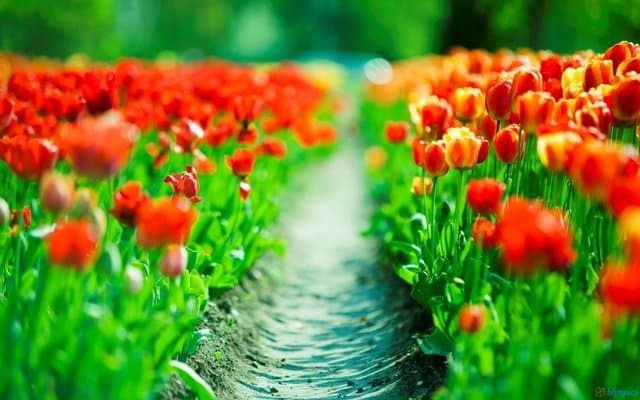 It is the Earth element, and Earthly colors can promote tenderness in that area while strengthening the Earth element (especially needed if that area is missing or has limited space). You can also use objects related to Earth or Fire elements to activate the Earth element in that area. Here’s an extra tip. There are many other feng shui factors that influence the love and romance in your life, such as the location of your bedroom and how your personal Kua fits with your home. These are big concepts that cannot be communicated in just a few tips, but I just wanted you to know that they’re out there. Even if you follow all these tips and received help from Feng Shui Masters, YOU still have to work on finding love or to improving your current relationship. Meaning, you still need to be attentive to your partner’s needs while making sure that both of you spend time together. 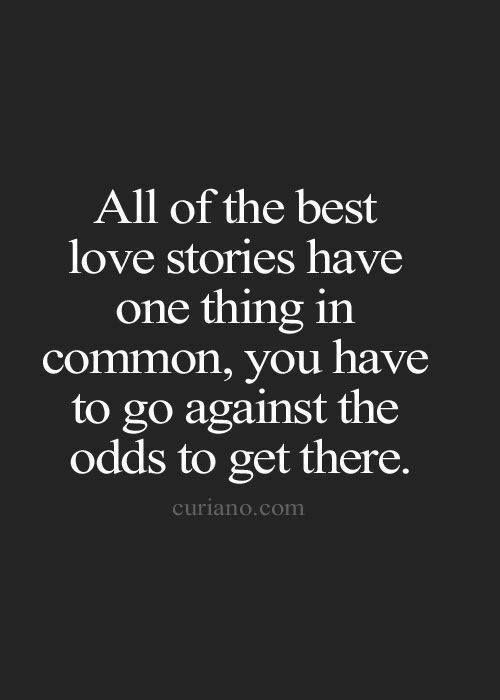 You are the one that can make the difference, despite all the obstacles that come to you. In other words, do not expect that after all the feng shui improvements, your true love will come knocking on your door or that your current partner will love you even if you never make the effort to spend time together. I hate to break it to you, but feng shui is NOT magic, nor is it a love spell. But I can tell you this: it’ll definitely help a great deal if you put in that effort. You’ll notice that your relationship will face less hurdles, and your love life will grow stronger each day like a tree that’s properly fed with clean air and water. Using Feng Shui and some psychological principles can definitely help with seeking love or improving your relationship. If you truly want feng shui to assist you, I suggest that you seek professional help because following these tips can only get you so far. Has any of these tips worked for you? What other feng shui love tips have worked for you? Please share your thoughts by commenting below!